Domtar reported net earnings of $20 million ($0.32 per share) for the first quarter of 2017, compared to net earnings of $47 million ($0.75 per share) for the fourth quarter of 2016 and net earnings of $4 million ($0.06 per share) for the first quarter of 2016. Sales for the first quarter of 2017 were $1.3 billion. Operating income was $42 million in the first quarter of 2017, compared to an operating income of $74 million in the fourth quarter of 2016. Depreciation and amortization totaled $80 million in the first quarter of 2017. The decrease in operating income in the first quarter of 2017 was the result of higher maintenance costs, lower productivity, lower average selling prices and higher raw material and other costs. These factors were partially offset by higher volume, lower selling, general and administrative expenses and favorable exchange rates. When compared to the fourth quarter of 2016, manufactured paper shipments were up 1 percent and pulp shipments increased 9 percent. The shipments-to-production ratio for paper was 105 percent in the first quarter of 2017, compared to 104 percent in the fourth quarter of 2016. Paper inventories decreased by 36,000 tons and pulp inventories decreased by 61,000 metric tons when compared to the fourth quarter of 2016. For the remainder of the year, we anticipate paper shipments to be in line with market demand. We expect to benefit from recently announced pulp price increases, while mix should continue to improve as we convert to more fluff pulp sales at our Ashdown Mill. Costs, including freight, labor and chemicals, are expected to marginally increase. In Personal Care, market growth, investments in advertising and promotion, in addition to new customer wins, should drive higher sales, while raw material costs are expected to marginally increase. 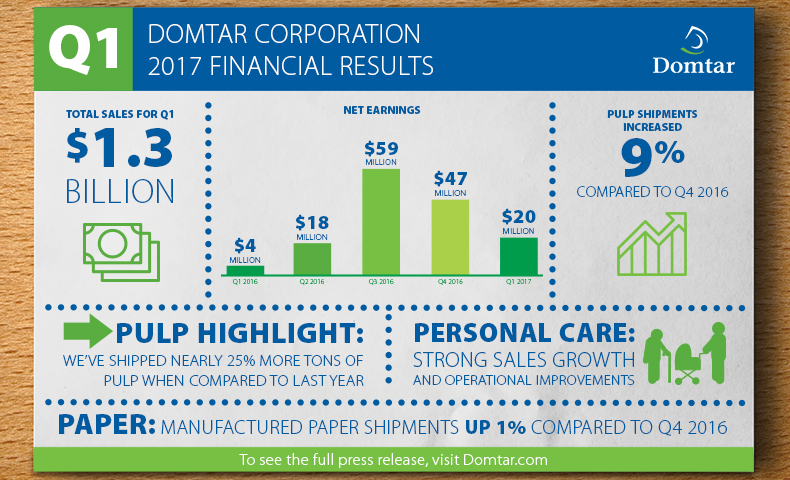 For more information on this Domtar quarterly financial report, please read the full press release.